Thank you for purchasing my Theme. If you have any questions that are beyond the scope of this help file, please feel free to submit a Support Ticket here. You can also view my ThemeForest profile here. 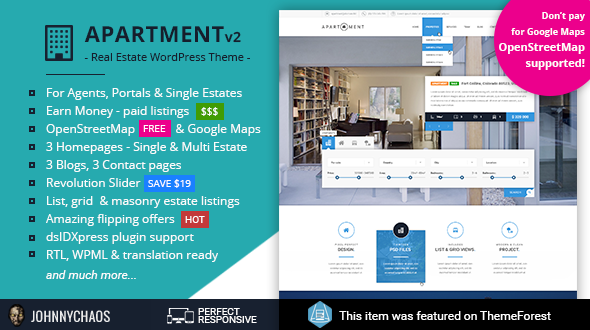 Apartment WP is a modern and creative Real Estate WordPress theme. Beautifully crafted on the one hand and technically advanced (but yet simple to customize) on the other hand. 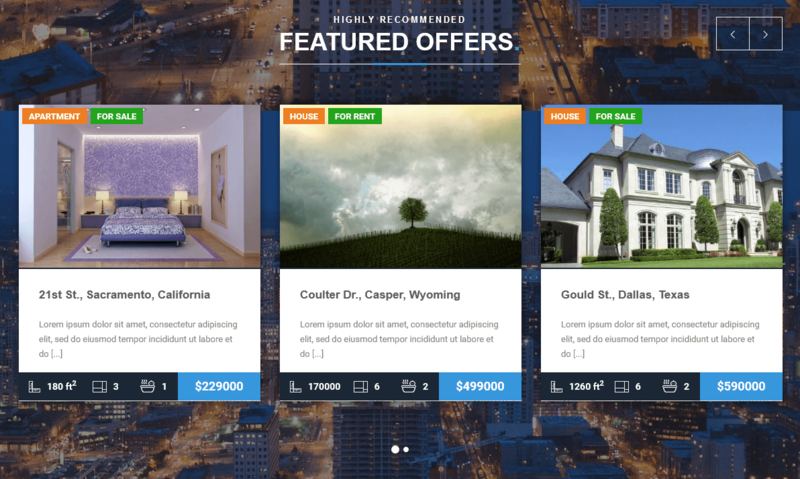 As a experienced developer who works with real estate industry since 2003, I decided to create a Theme that truly stands out of the crowd and present estates in the most efficient way. 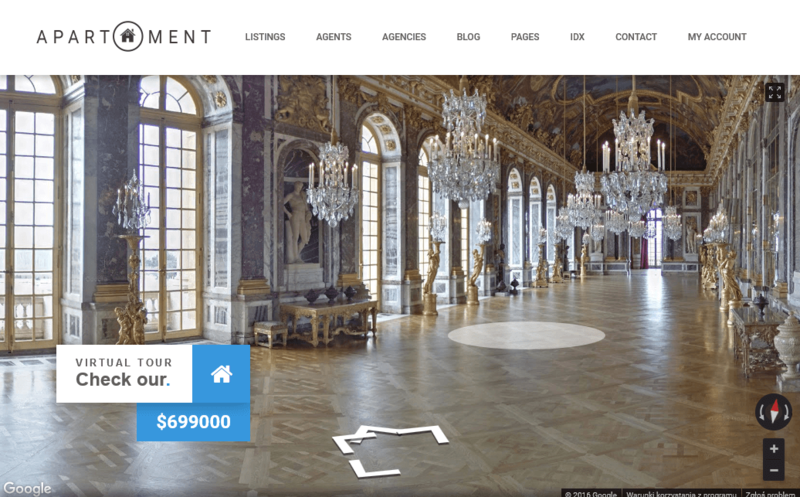 Top notch industry options like advanced Google Maps and OpenStreetMap, Street View and panoramas with stunning visual effects will help you to outdistance your competitors whether you are agency, estate portal, single agent or a private estate owner. Disclaimer: I offer limited support for my themes. I only provide support for theme's core features. I cannot guarantee that this theme will work properly with all third-party plugins and server environments. If you plan on adding numerous plugins to this theme then please note, I cannot facilitate support for any conflicts that might arise with this theme's default functionality. I take no responsibility or liability for any damages or loss caused by using this theme, but I make my best to fix all errors that can occur. Note: Documentation may seem big and complex but if you import demo content most of the steps described below will be already done for you. You will just have to adjust options to your needs. Everything is described step by step and you don't need any technical knowledge or WordPress experience. Note: I'm offering express installation and configuration service for this theme. Check Chapter 25 for details. 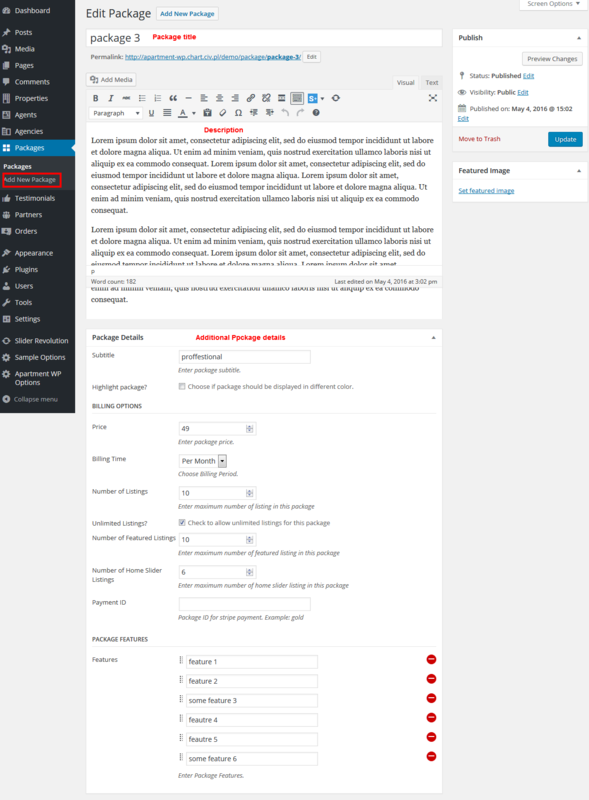 To run this theme you must have a WordPress platform already installed on your server. 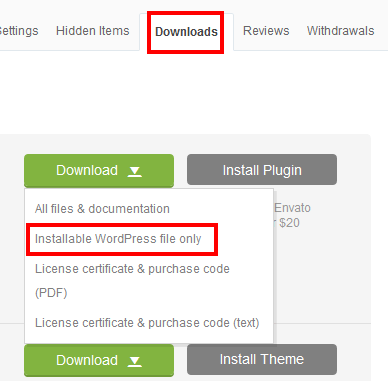 You can download latest version of WordPress on it's official website. For information in regard to installing the WordPress platform, please read the WordPress Codex - http://codex.wordpress.org/Installing_WordPress. If you're looking for good WordPress hosting, I can recommend you SiteGround. I use their servers to host demos of my themes and I'm satisfied with the quality, performance and quick support. Even the StartUp plan is very fast. They can migrate your website for free and you have money back guarantee. 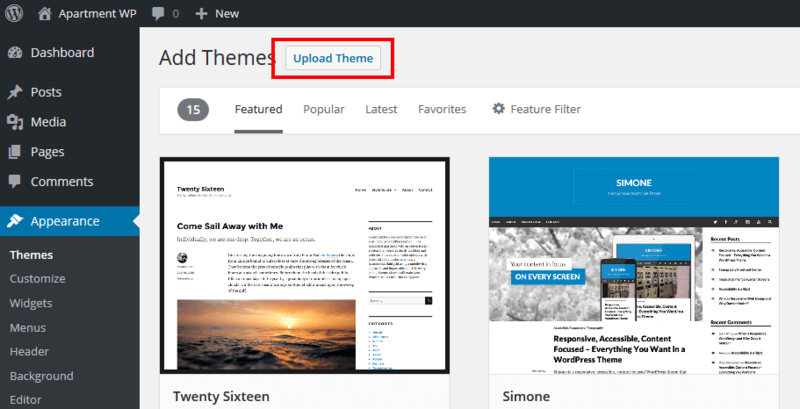 Note: Theme is compatible with WordPress 4.5 and above. Unzip apartment-wp.zip file. Upload theme folder (apartment-wp) to /wp-content/themes/ folder on your server. You can use your web hosting file manager or some FTP software like FileZilla. 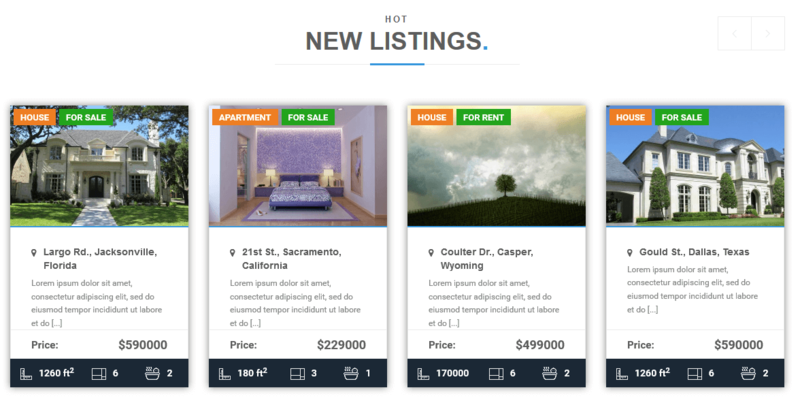 Apartment WP Utils (required) - adds main theme functionality, post types and shortcodes. Theme comes with 8 demo contents, to help you painless start customizing the page. 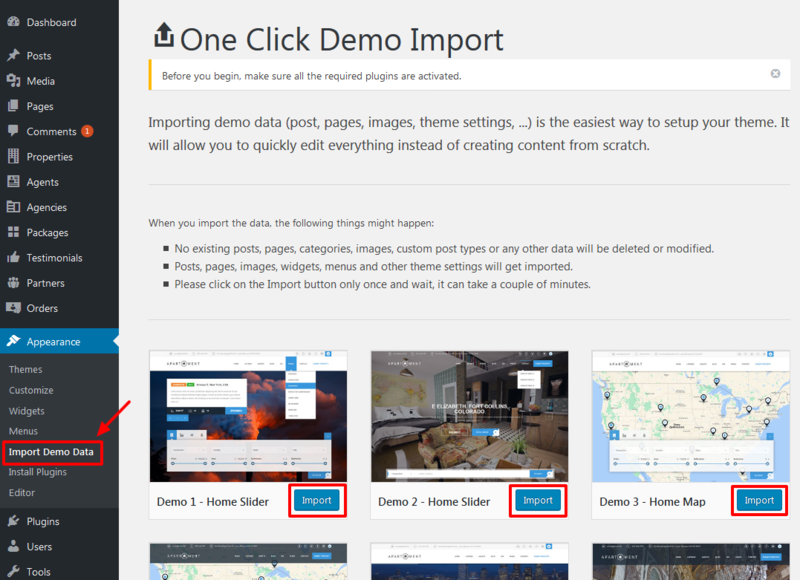 You can use built in One Click Demo Importer. It will import all data including posts & pages, widgets, menus, theme options and revolution sliders. First install the theme and activaye all required plugins. Make sure that One Click Demo Importer is also active. Click on the import button and wait. Importing can take few minutes so don't navigate away form the import page until you receive success confirmation. Note: If the import fails (you will see memory error or a blank page) you can try to repeat the process few times. You can also import content wihtout downloading attachments. To update the theme install Envato Toolkit Plugin. 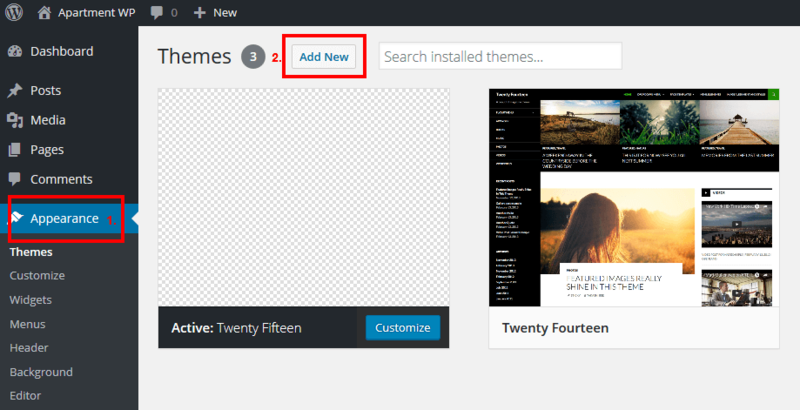 Here is a tutorial how to use this plugin to update your theme: https://premium.wpmudev.org/blog/how-to-update-themeforest-themes-with-the-envato-wordpress-toolkit/. 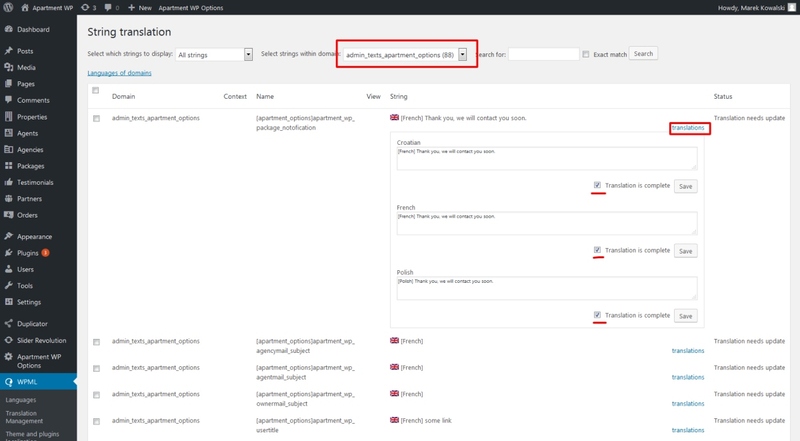 You can also use FTP method and replace files located in the "wp-content/themes/apartment-wp" folder. 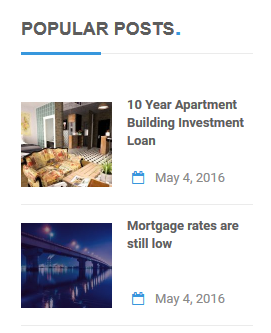 By default the homepage will show up your latest blog posts. 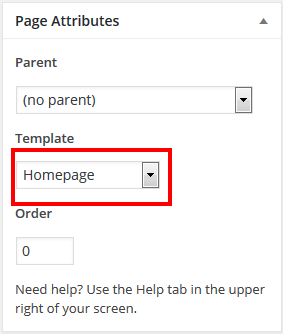 If you want to show up a custom homepage (like in demo), you must create two new pages (Pages -> Add New) - one for homepage, second for blog page. For example you can create one page called „Homepage” and one called „Blog” (Note: you can choose other names, it's just an example). Pages can be empty for now. Note: If you imported demo data, those pages are already created. You can choose custom header for almost each page. 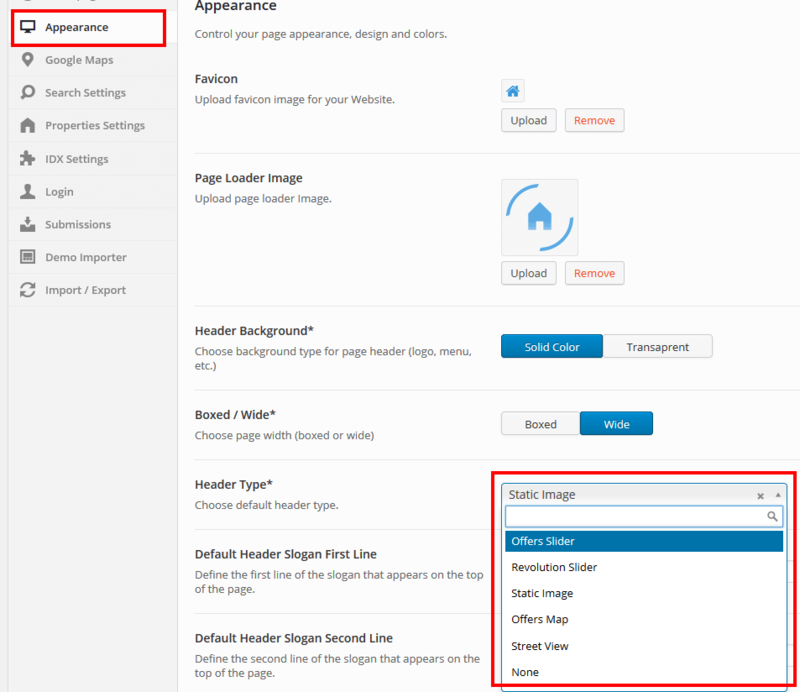 You can set default header in Theme Options and on every page in Page Options. 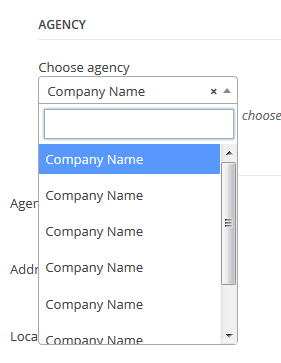 Each option has additional fields to specify data. Note: You can't choose headers in some pages like "property details", "properties list", "my account" or "contact". 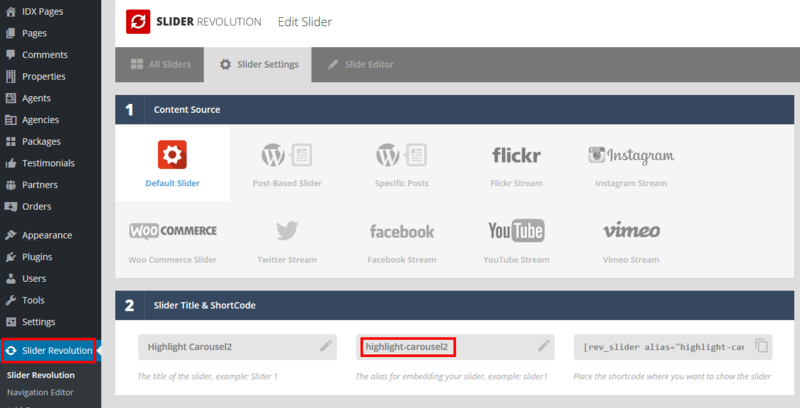 Revolution Slider plugin have to be installed. You can add a Revolution Slider to header. You can create your own or choose and adapt one of the big sliders collection. You can add Street View in the header. You can choose if Panorama should auto-rotate and specify slogan. 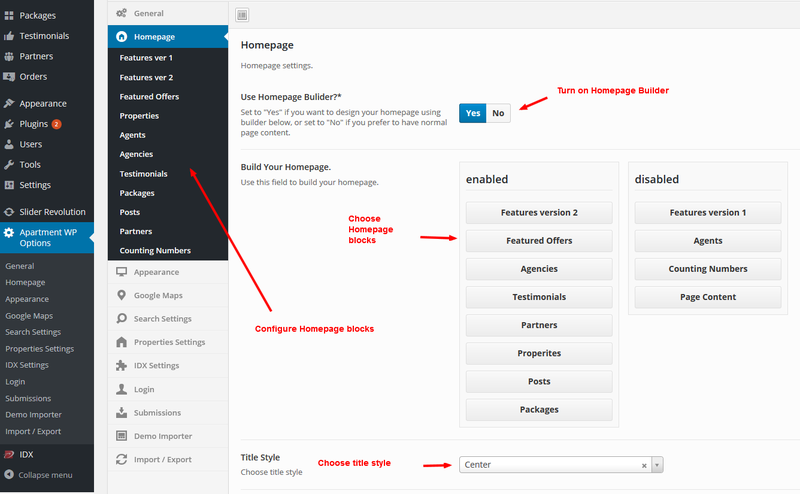 Apartment WP is equipped with Homepage Builder. When you turn it on you can chose page sections you want to attach. If you left it "off" regular "Homepage" page content will be displayed. To choose Homepage block drag them from "disabled" section to "enabled". You can also change blocks order with drag & drop. You can add two page blocks. Note: If you add block background image and choose "background attachment: Fixed", parallax effect will be automatically added to this background. Theme has many "Theme options" that allows you to customize the page. Many of the options are required, so make sure you check all of them. You can access options from dashboard or from live customizer. 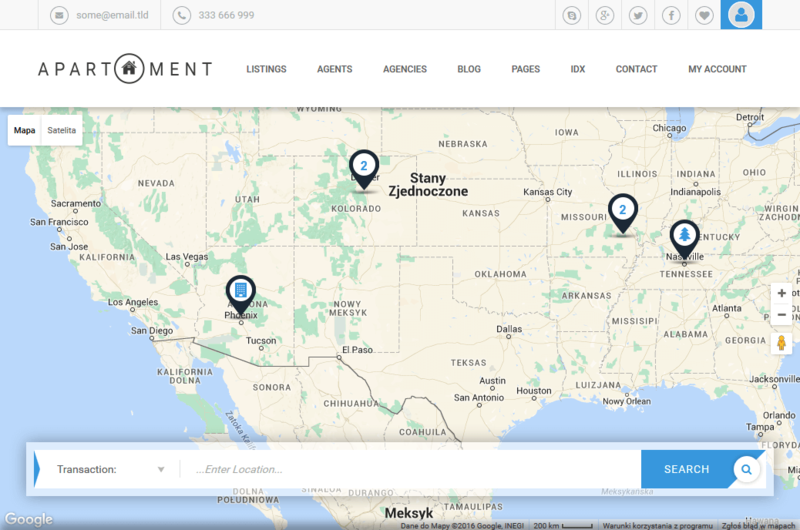 You can find them under "Apartment WP Options -> Maps"
Theme allows you to choose you maps provider: Google Maps or OpenStreetMaps. Since July 16, 2018 Google Maps has new pricing, that can affect even small websites. OpenStreetMap is an open source and free platform that is almost as powerful as Google Maps. Limitations are: lack of Satellite View and Street View. Google Map API key. It's required to have the key. Get it HERE. Enter this key even iy you use OpenStreetMaps. Street View will be still available using Google Maps API. Pins. Upload Pin Images for every Property Type you create. It will be used to mark property location on map. In "images" folder in downloaded package you will find already created Pins matching all predefined skins. Note: Google Maps will be used for Street View, IDX map and location map on "Add Property" page in WP Dashboard even if you choose OpenStreetMap as your map provider. 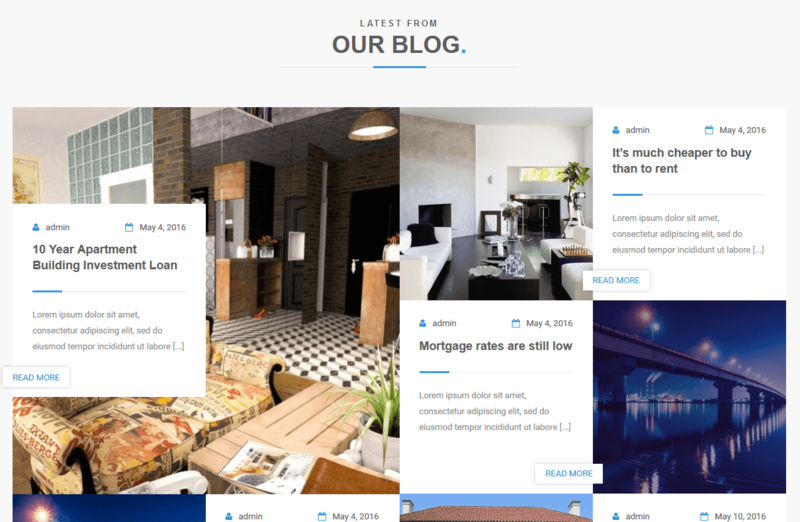 Apartment WP supports one main menu located in the header as well as menus in sidebar and footer. You can add menu to footer or sidebar by using "Custom Menu" widget. First create the menu and don't specify "Theme locations". 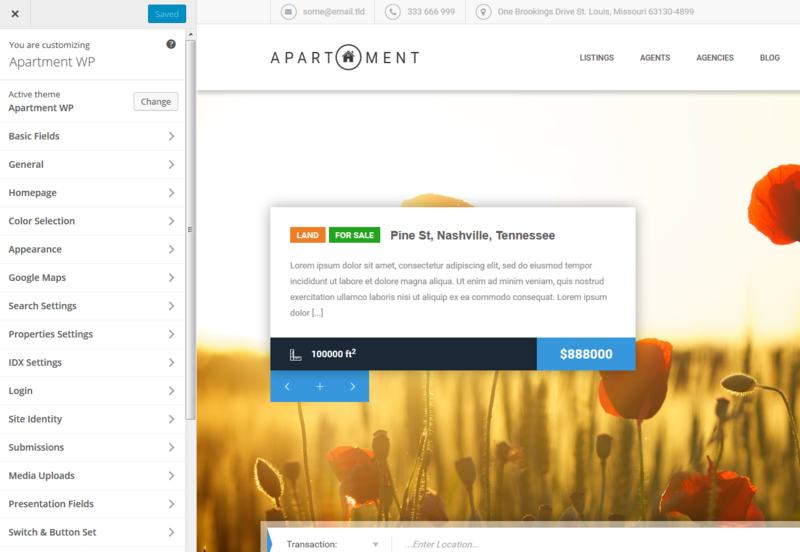 Apartment WP allows you to add widgets to sidebars and footer (if you set "Footer Type" to "Big"). Theme supports all default widgets and introduces few own. All dsIDXpress Plugin widgets are also supported. You can add a sidebar to almost every page (except Homepage, Contact ver 1, Contact ver 2, and My account pages) and you can set its location (left or right). 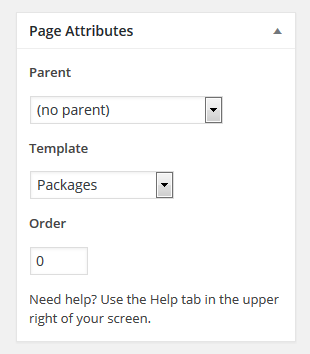 By default pages show "Default Sidebar" but on "Sidebar Options" you can force it to show one of the custom sidebars (Custom Sidebar1, Custom Sidebar 2). 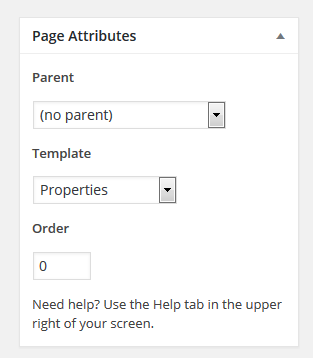 You can add different set of widgets to this custom sidebars to create page specific side panel. Theme comes with few custom widgets. 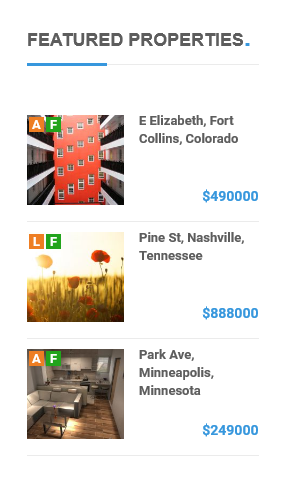 Displays Page Info ("Settings -> General -> Tagline") and contact details ("Apartment WP Options -> General"). Allows to add search form. You can specify form fields to adjust it to your needs. Displays properties. 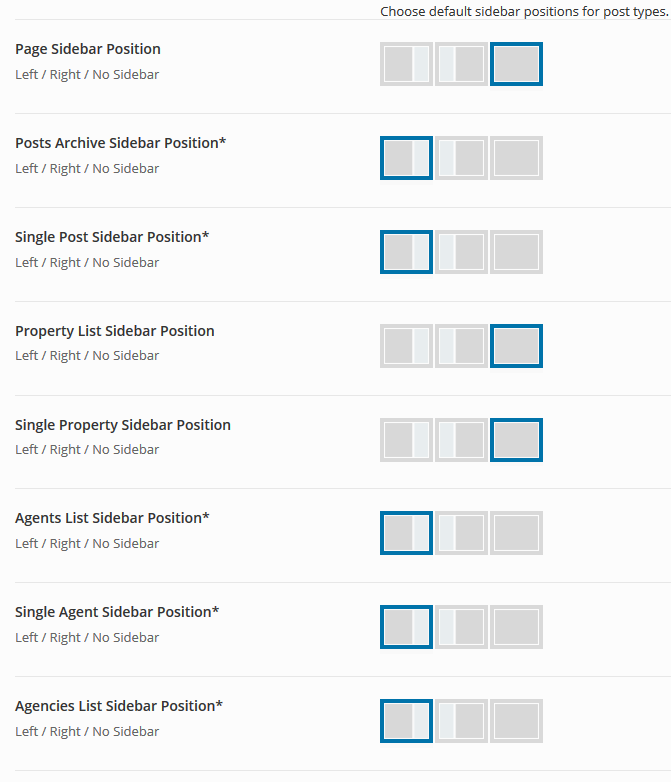 You can specify properties source: featured, new or custom (add comma separated IDs) and number of offers to show. 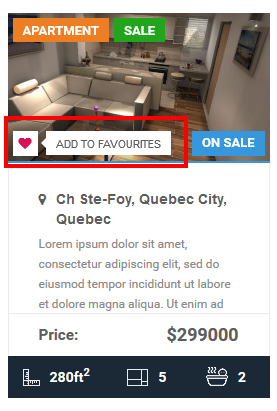 Displays properties that user added to "Favourites". You can specify number of offers to show. Display posts with thumbnails. You can specify source: popular or custom (add comma separated IDs) and number of offers to show. You can also decide to show or hide the post date. 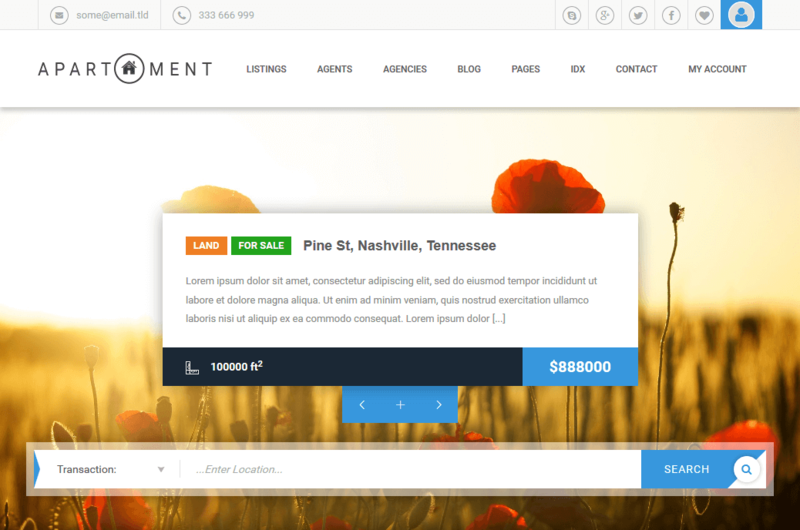 Paartment WP comes with the Custom Post Type do diplay properties. 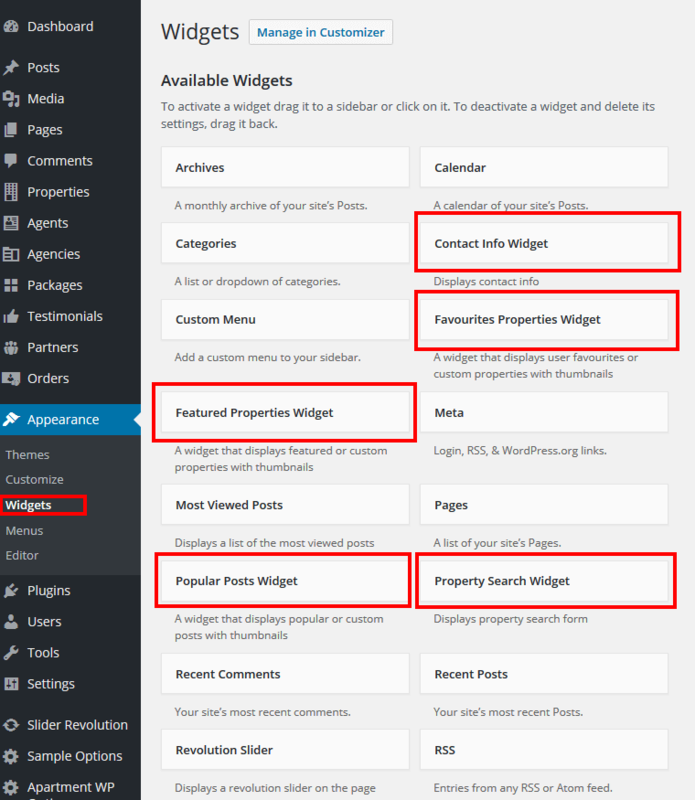 You can add properties from WP Dashboard or from front page account. 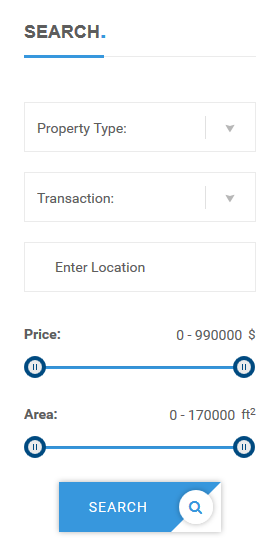 transaction type - usually its "sell" and "rent"
status - you can add some additional status like "on sale", "sold", "open house", "hot offer" etc. property type - specify all available types like "apartment", "house" or "land". You can make them hierarchical, for example "house" can have children like "villa", "condo" etc. 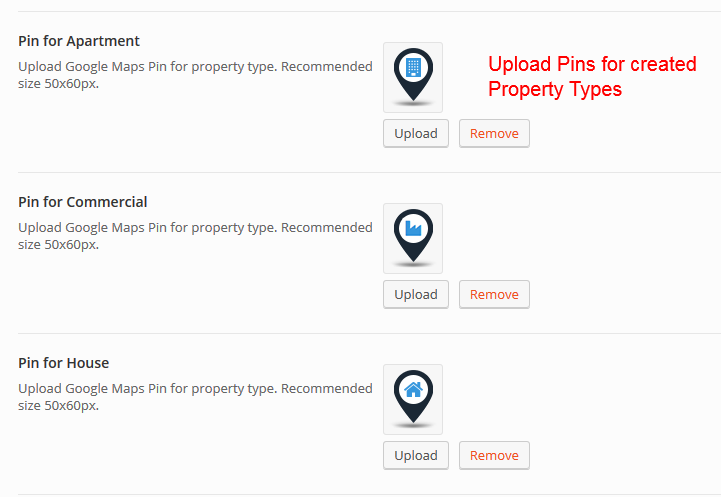 Once you create Property Types go to Apartment WP Options -> Maps and upload Pin for every Type. Those Pins will be used for map. 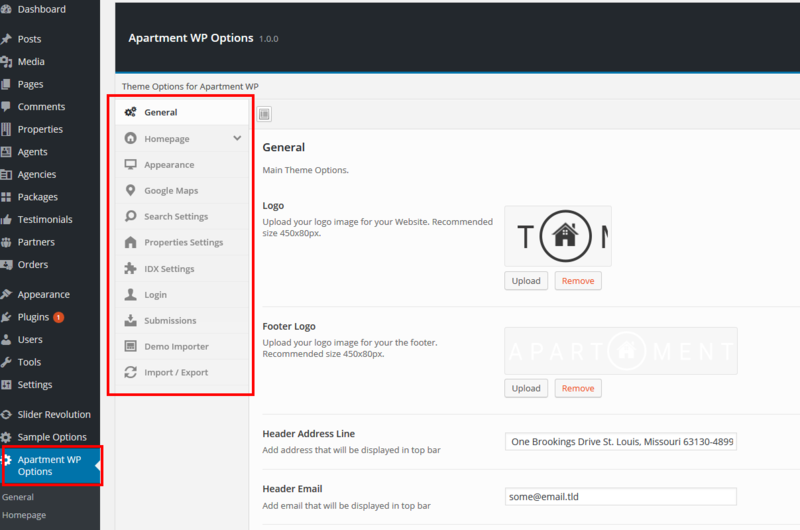 Next go to Apartment WP Options -> Search Settings and add an icon for every Type. 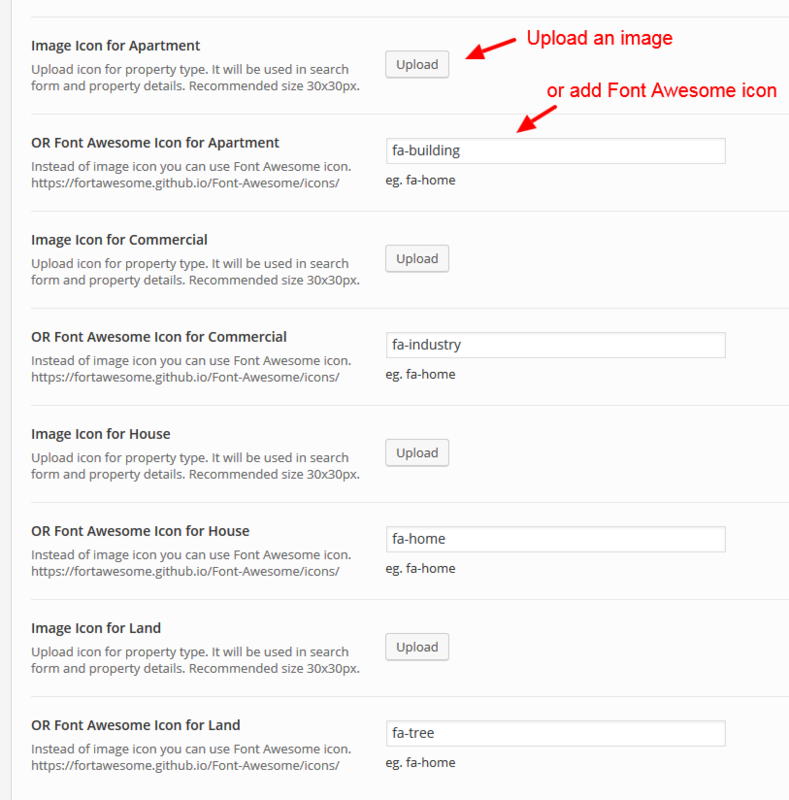 You can upload an image (recommended size 30x30px) or use Font Awesome icon. Here is full list: Font Awesome Icons. Icons used in demo are: fa-building, fa-home, fa-tree and fa-industry. location - property location. This also can be hierarchical, you can create for example relation "countries -> states -> cities -> districts". 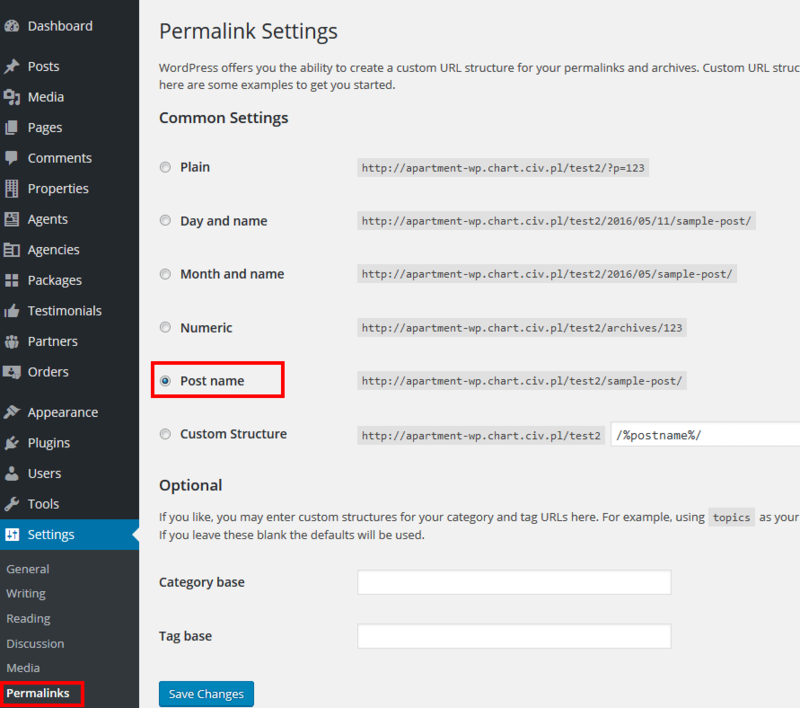 Once you create location hierarchy go to Apartment WP Options -> Properties Settings and add labels for location levels. For example top level locations can be Country their children you can call Province etc. If your localization is: "USA -> Florida -> Orlando" then labels can be "Country -> State -> City". property type - specify all available types like "apartment", "house" or "land". You can make them hierarchical, for example "house" can have children like "villa", "condo" etc. Check previous point for details. 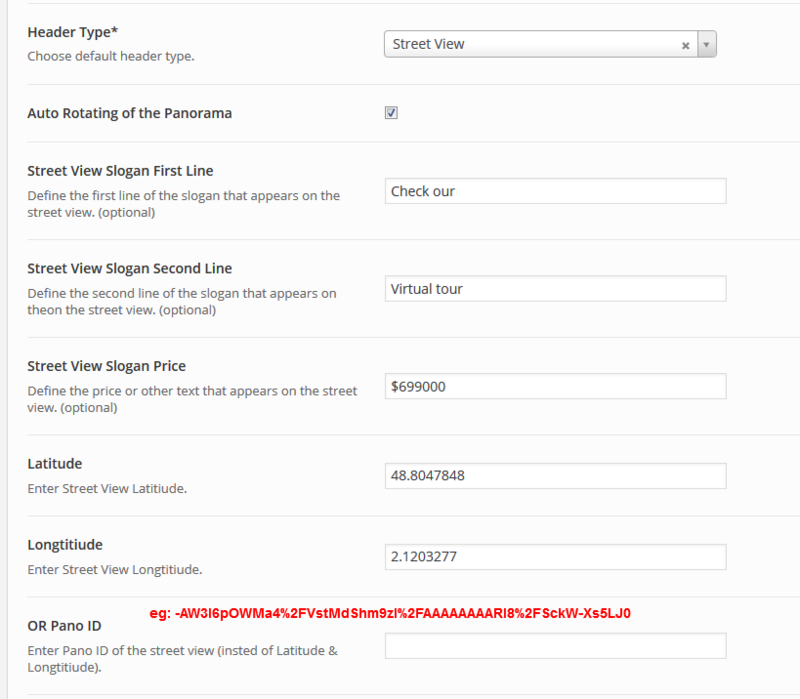 Fill all required fields and click "Submit property". 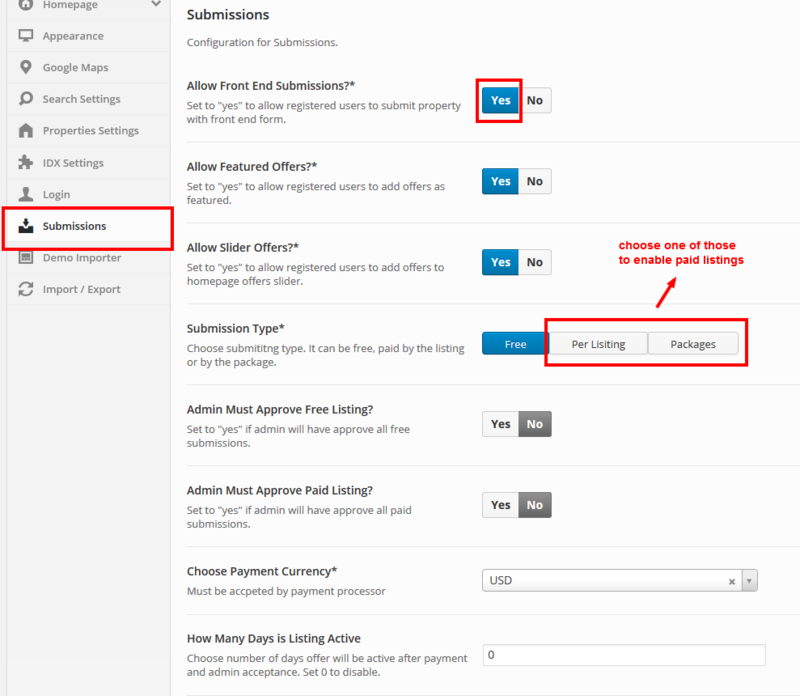 Note: Offers can be "Pending Approval" by the admin if it was switched on in Theme Options. You can find more details in chapter 19. 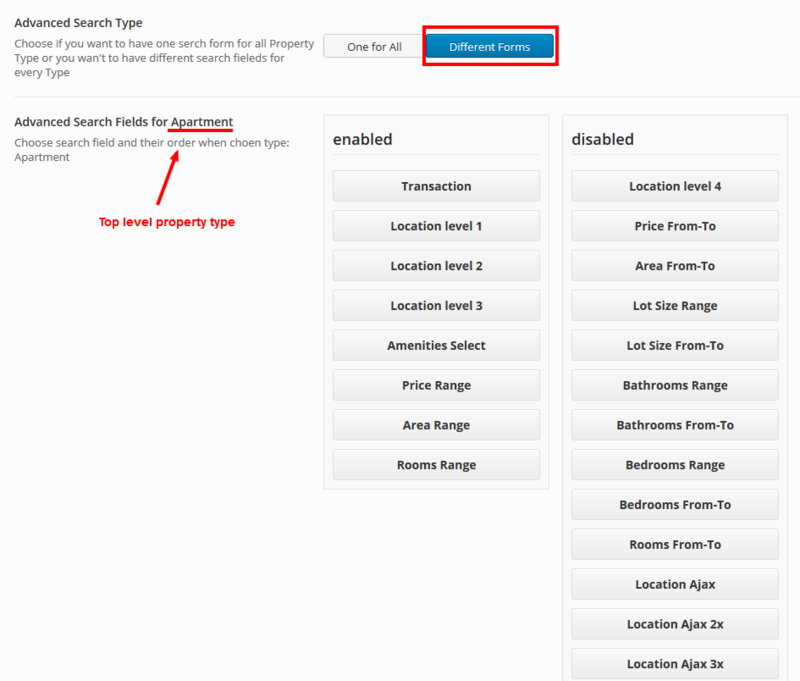 Then when you navigate to this page, all properties will be displayed. Apartment WP comes with "Agent" customs post type. You can add agents from WP Dashboard or they can register via front page form (see chapter 18 for details). 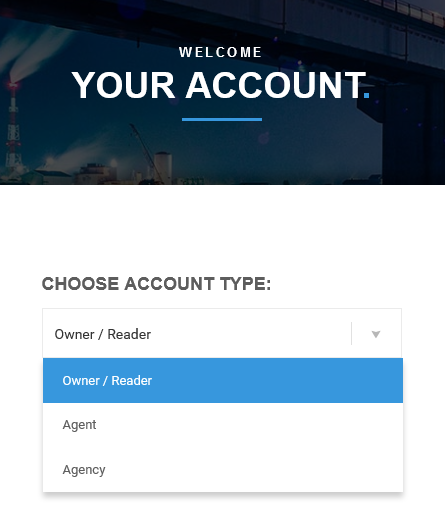 turn on "Apartment WP Options -> Login -> Enable Front End Login"
create a WP user with role "Subscriber"
edit this user and set: "User role -> Agent"
Then when you navigate to this page, agents list will be displayed. Apartment WP comes with "Agency" customs post type. 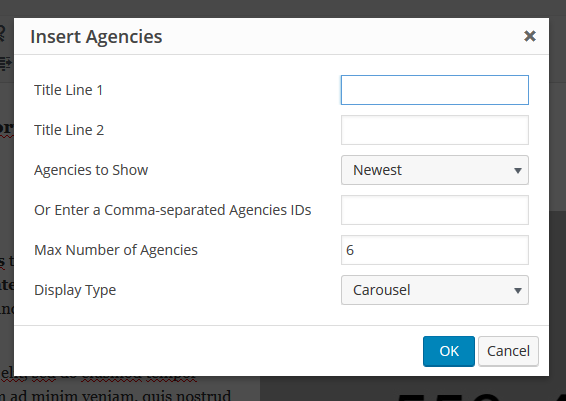 You can add agencies from WP Dashboard or they can register via front page form (see chapter 18 for details). edit this user and set: "User role -> Agency"
Then when you navigate to this page, agencies list will be displayed. Apartment WP comes with "Testimonials" customs post type. You can display testimonials as a homepage block (Chapter 7) or as a shortcode (Chapter 21). 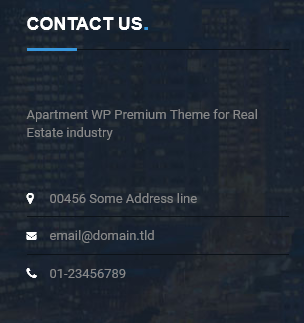 Another custom post type you can use in Apartment WP "Partners". It allows you to show carousel of logos (partners, clients etc). each logo can be a link to your partner website. You can display partners as a homepage block (Chapter 7) or as a shortcode (Chapter 21). 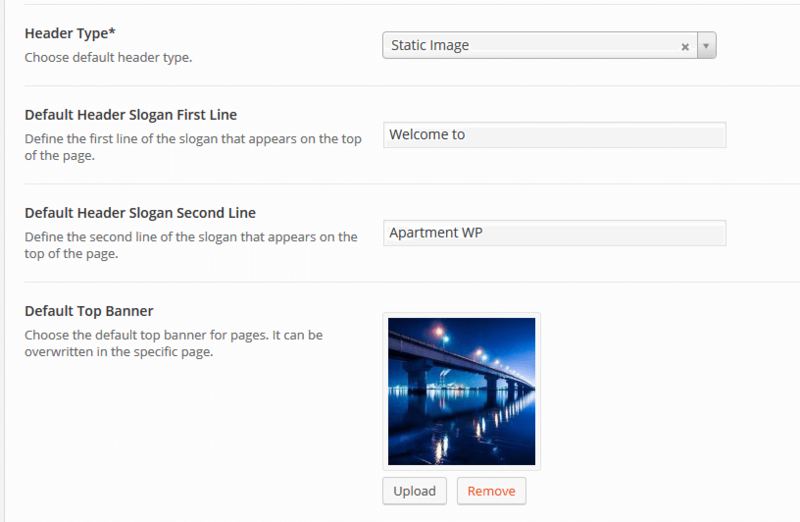 You can create "Packages" customs post types with Apartment WP. They will be used id you decided to charge for offers based on billing plans. Then when you navigate to this page, packages list will be displayed. User can view favourites by clicking heart icon in the top bar (image below). You can also add "Favourites Properties Widget" to sidebar or footer. You can allow users to register on your page. Registered user can add his own listings and manage his profile. 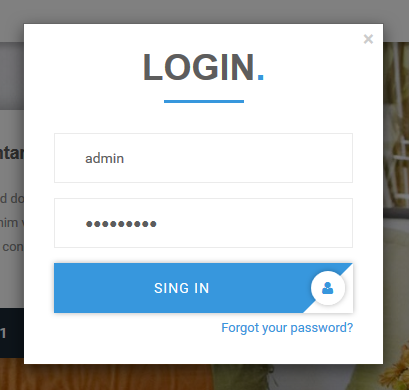 You can decide to turn on or off front page login and registration. 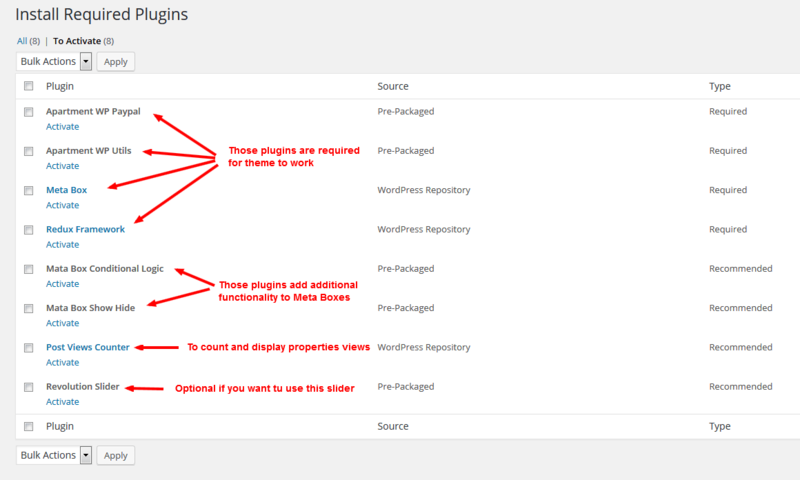 For example you can create accounts by yourself in WP Dashboard and only let users to log in. 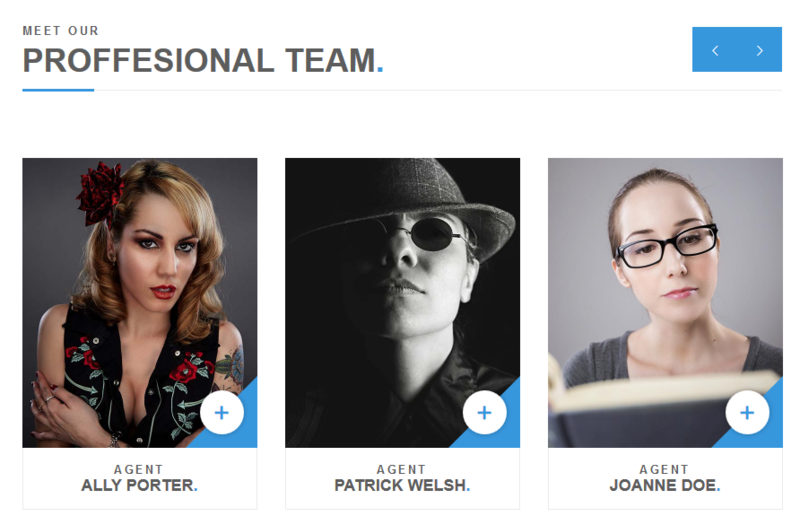 It can be useful if you have Agency and want to add an access to your agents. 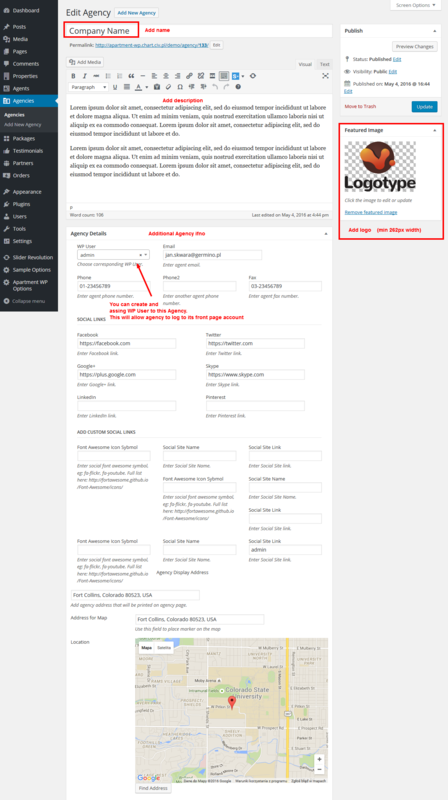 To allow users to register you need to turn on registration in "Settings -> General"
You can also add content to "Welcome" mails separate for every account type ("Apartment WP Options -> Login"). The heart of every real estate website is the search engine. Apartment WP has the most advanced and flexible solution on the market. Below you will find detailed instruction how to adjust it to your needs. Simple search allows you only to choose transaction type and location. 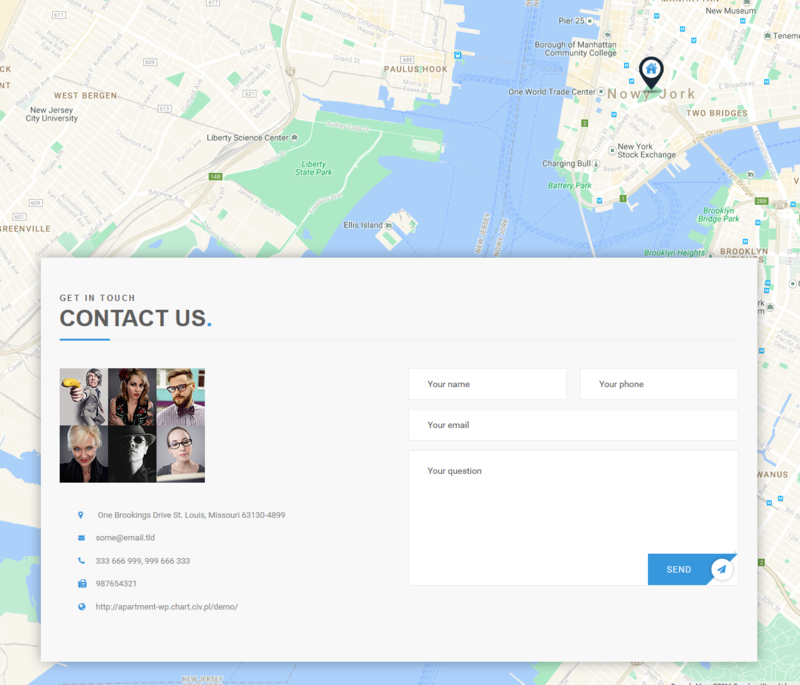 Location input uses Ajax to suggest location during typing. You have two advanced search options. You can have the same form for every property type or you can create separate forms for every top level property type. 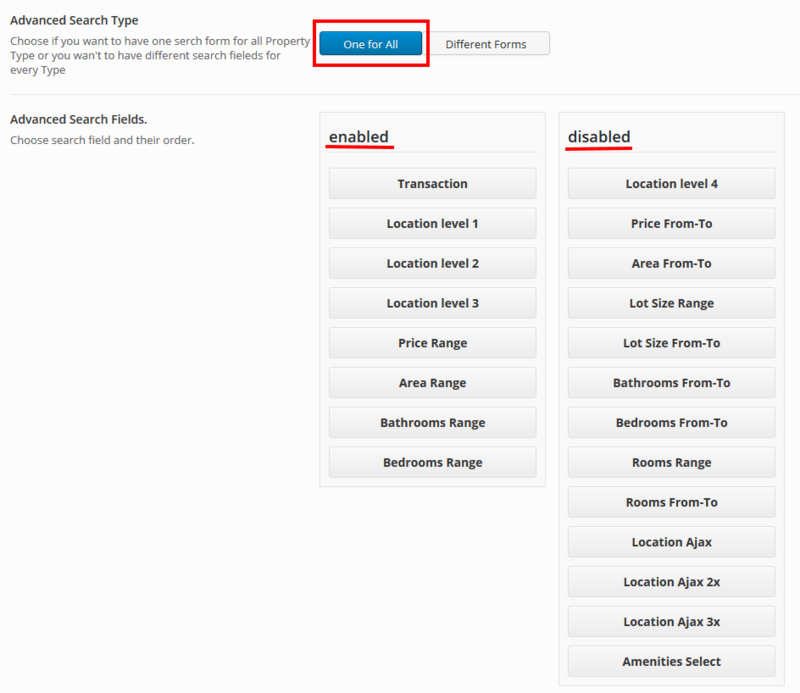 You choose search fields by dragging them from "disabled" to "enabled" section. You can also change fields order. Keep in mind that there are four fields in one row. 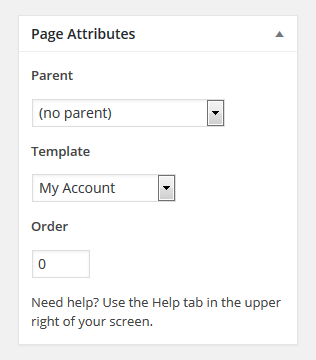 This form works only when dsIDXpress plugin is installed. 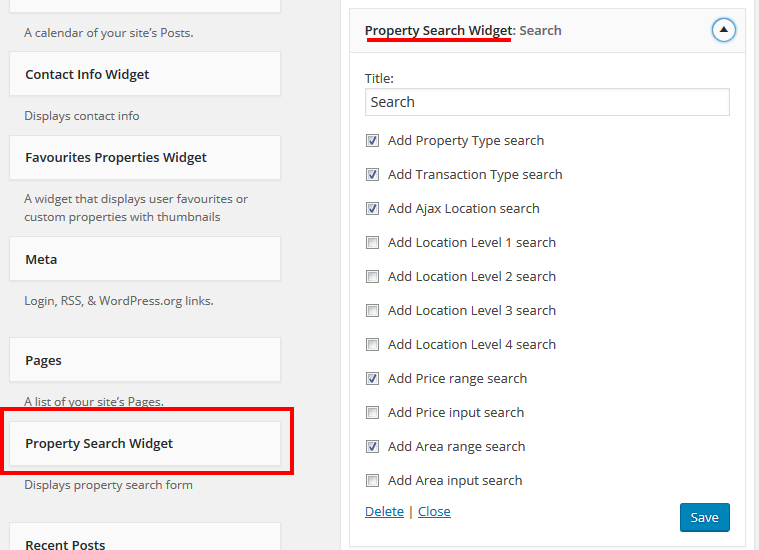 It searches in MLS database instead of properties added in WP Dashboard. 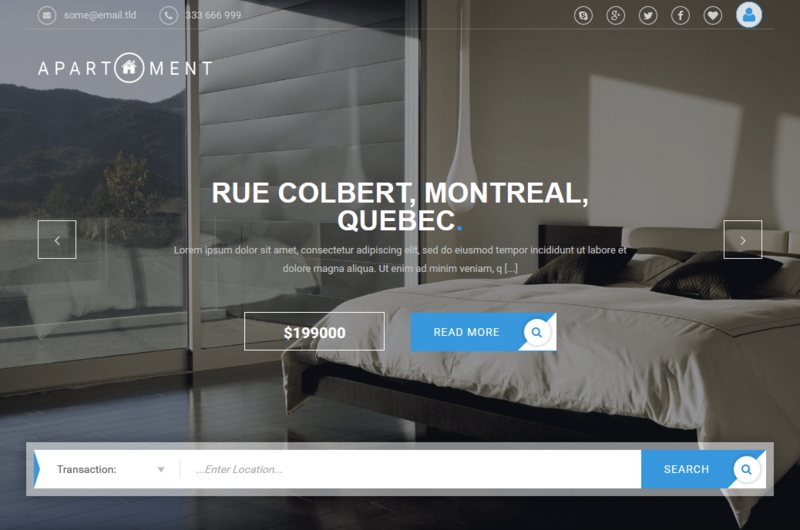 Button - add Apartment WP style button, use predefined colors and icons or add your own. Columns - divide your page into responsive columns. You can have 2,3 or 4 columns + plus all combinations like 1/3 + 2/3, 1/4 + 3/4 etc. Dividers - add margins and few kinds of horizontal lines. Blocks - add styled info, warning, code and other blocks. Panels - add accordions and tab panels. 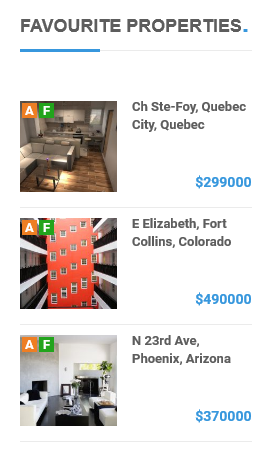 Lists - add unordered Apartment WP style lists. 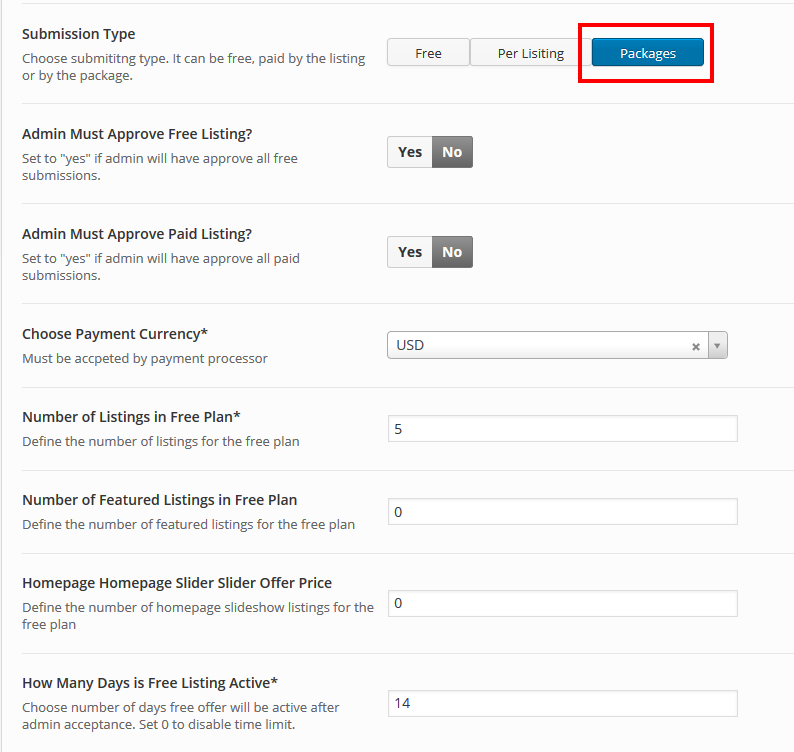 Apartment WP allows you to monetize your page and charge users for listings. You can charge for single listing or you can create and sell packages. 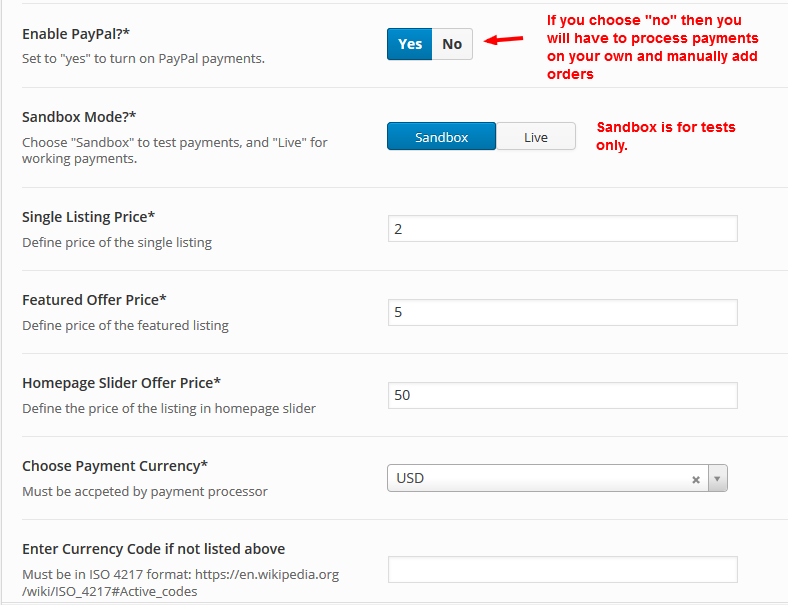 set "Enable PayPal" to "yes" in "Apartment WP Options -> Submissions"
Login to create a PayPal Application at this URL https://developer.paypal.com/developer/applications. 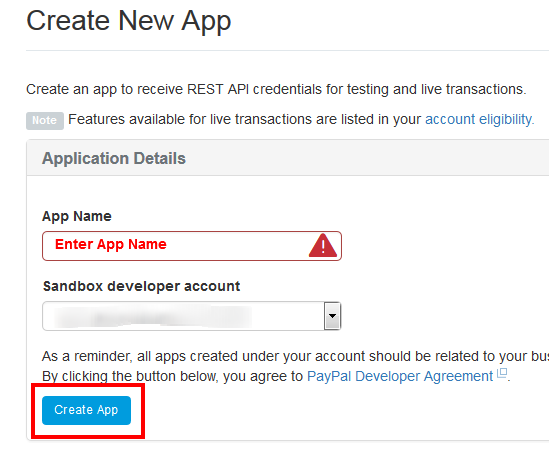 Create new Rest API App and copy the Client ID and Secret Key provided in Admin - Theme Options - Membership Settings. 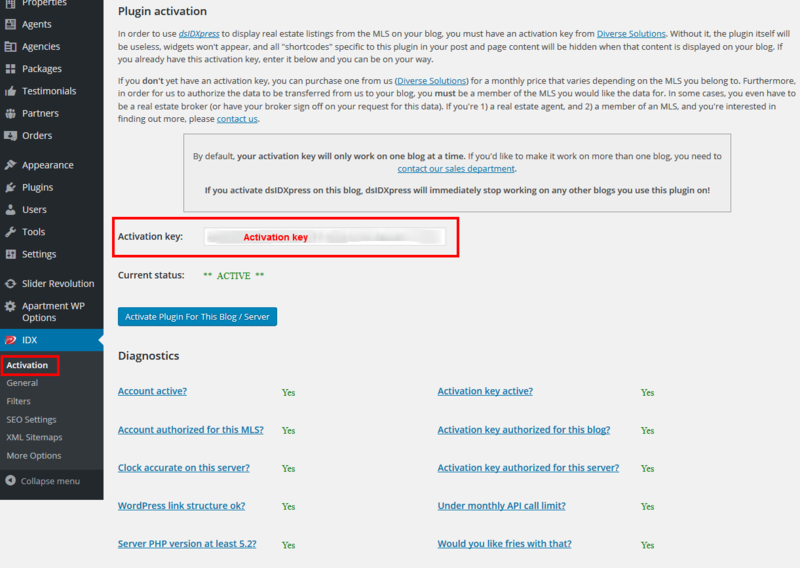 Copy the Client ID and Secret Key and paste them in the appropriate fields in "Apartment WP Options -> Submissions". 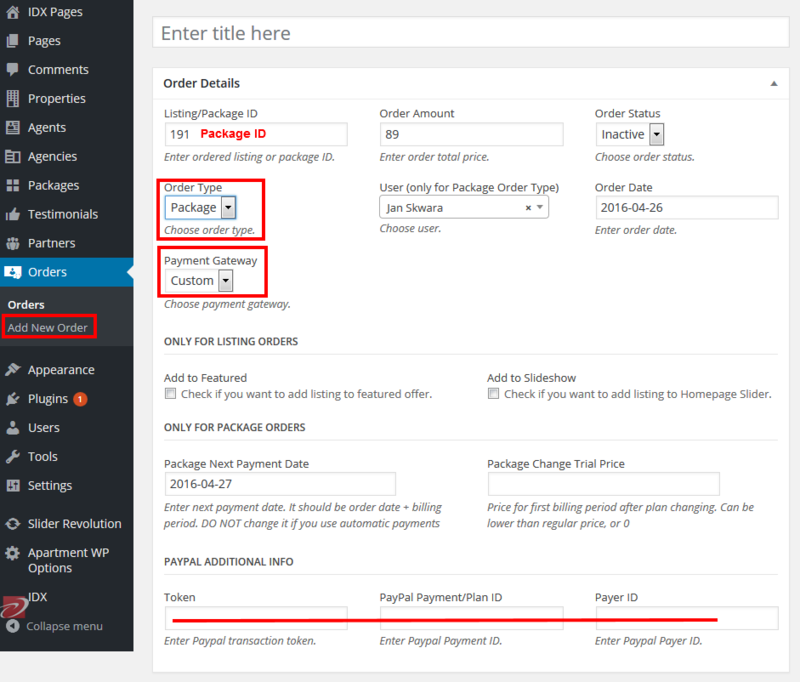 Now registered user will see the option to activate offer and add it to features or homepage slider with prices. Clicking on "floppy" icon will send him directly to PayPal payment page. If you don't want to use PayPal and process payment by your own, you can still use this system. 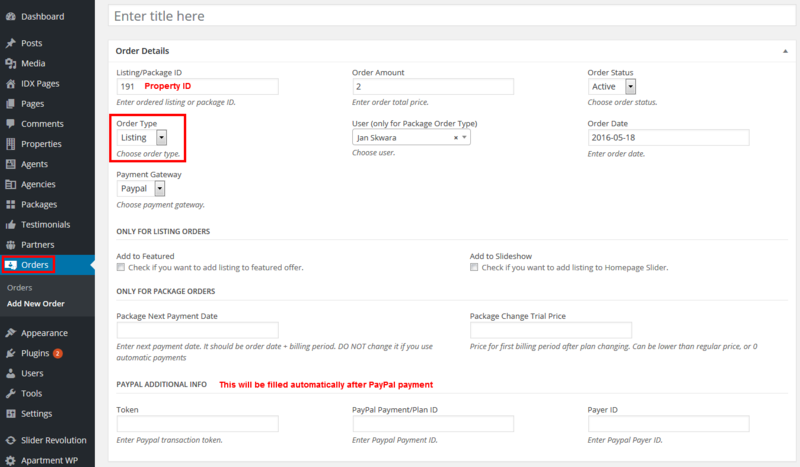 All you need to do is to add a new order with all required data ("PayPal additional info" should be omitted). When you save an order corresponding Property will be updated automatically. Next add some Packages - see Chapter 16. Theme uses Cron functions to perform automatic actions. 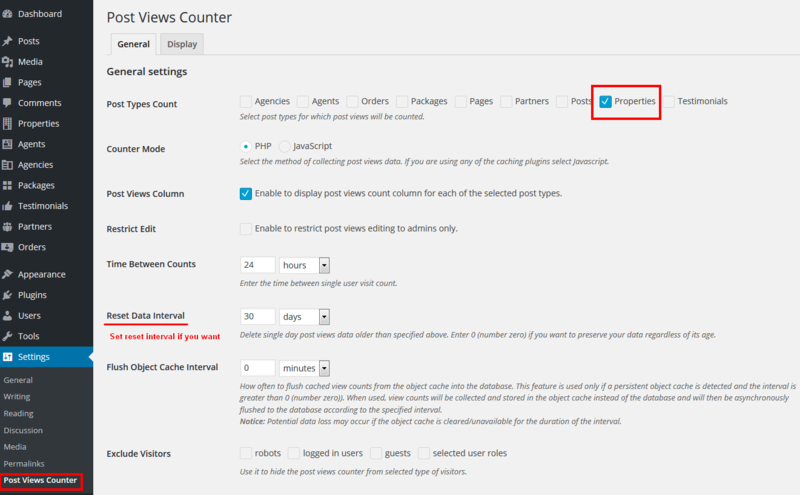 It periodically checks for expired offers and packages and sends notification to users and admin. It also change status of expired offers to inactive so you don't need to do it by yourself. This theme is compatible with dsIDXpress Plugin. Please note that this plugin is free only for demo purposes. If you want to use it please buy license on Plugin Page. Note: I'm not connected in any way with plugin authors. With all plugin related issued you need to contact Diverse Solutions. Except those required settings you can set all other options to suit your needs. 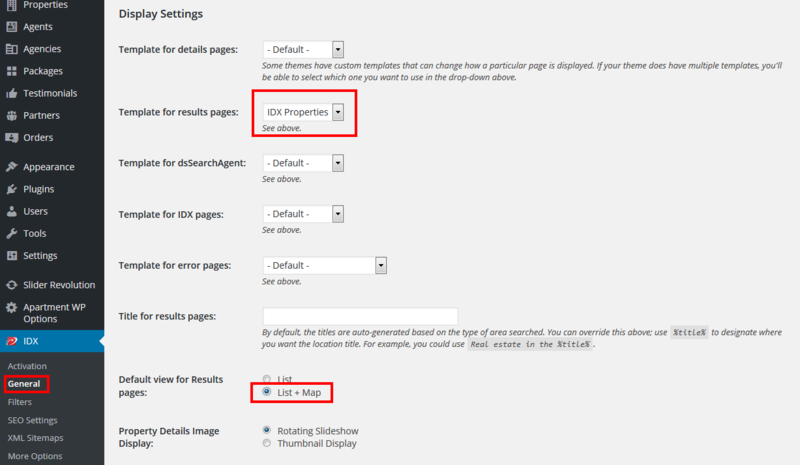 Additional related plugin settings you can find under "Apartment WP Options -> IDX". Apartment WP is "translation ready". it means that you can translate it to any language by editing language files. Read more about translating theme: here. 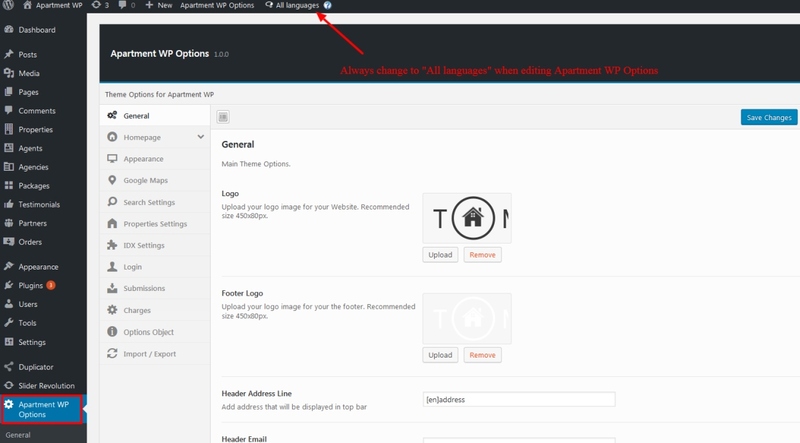 Here is what you need to know on turning Apartment WP multilingual with WPML. First, you need to to purchase a recent version of WPML, including the WMPL String Translation and WMPL Media modules. – Install and activate the core WPML plugins (WPML Multilingual CMS, WPML String Translation, WPML Media), and then other WPML plugins that may depend on them. – Set up WPML from "WPML->Languages". See WPML Getting Started Guide for complete reference, but the initial simple three-step setup is self-explanatory, asking you to choose your default language, a set of active languages, and a language selector. To translate a page you need to go to "WP Dasboard – Pages" and in the list you will see columns for each active language, with a pencil icon (for ‘edit translation’) or a ‘+’ icon (for ‘add translation’) next to each page. Do the same for Posts and Custom Post Types (Properties, Agents, etc.). Go to "WPML -> Taxonomy Translation". You can find all taxonomies there. You can add a translation to each value clicking on the pencil icon (for ‘edit translation’) or a ‘+’ icon (for ‘add translation’). From WordPress "Appearance->Menus" you can see your existing menus and add menu translations and synchronize menus across translations. Go to "WPML -> String Translation" and from the dropdown on the top of the page (Select strings within domain) choose "admin_texts_apartment_options"
Translate all strings you find there. Make sure, you check "Translation is complete" checkbox. Every time you change Apartment WP Options, go back here and check if translation is correct. SEO Configuration - includes: installation and activation of an industry standard SEO plugin, integration with Google Analytics and Google Webmaster Tools if information supplied, enabling of site map generation. Cost of this packages is $50. 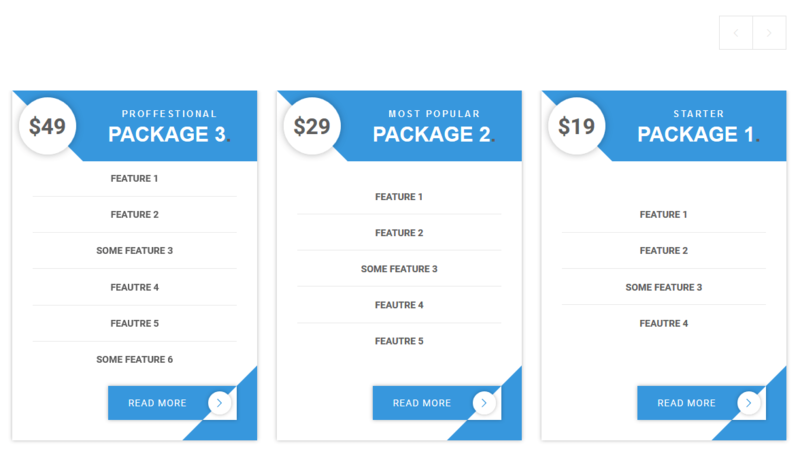 Customization of this theme is also available and it's based on my hourly rate – 30$/hour. Once again thank you for purchasing my Theme. Enjoy! If you have any questions that are beyond the scope of this help file, please feel free to submit a Support Ticket here. You can also take a look at my other themes and templates. Follow me on Themeforest to be notified about my new products.